Ehmergerd YES! This is amazingly delicious, VEGAN and baked, not fried. Wowzers. What more can you want?! Preheat a fan forced oven to 230°C. Line an oven tray with baking paper and coat with 1 tbs of canola oil. Cook McCain Cauliflower according to packet instructions. Once cooked, cut large pieces into bite sized chunks. Place almond milk, salt, pepper and chilli flakes in a medium sized mixing bowl. Sift in flours, bi-carb soda, baking powder and garlic powder, mix well to combine. Dip cauliflower pieces into batter, one at a time, allow excess to drip off and place onto the lined baking tray. Repeat until all are coated. Bake cauliflower for 7 minutes. Remove from oven, turn cauliflower pieces and drizzle with remaining canola oil. Return to oven and bake for a further 8 minutes. Meanwhile, place soy sauce, maple syrup, rice wine vinegar, sesame oil, garlic and chilli sauce into a small saucepan and allow to simmer, stirring frequently for 10 minutes. Combine water and cornflour, mix well to combine, add to sauce mixture and remove from heat. Remove cauliflower from oven, pour over sauce and return to oven for a further 5 minutes. 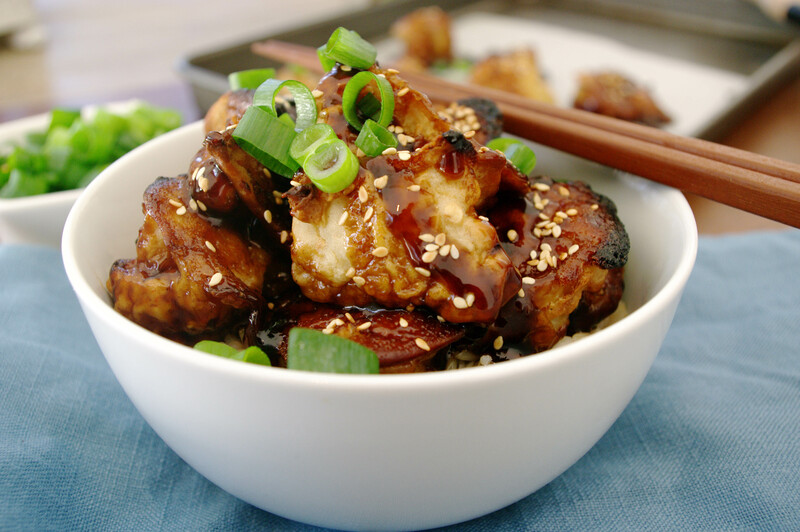 Top cauliflower with toasted sesame seeds and serve with brown rice and spring onions.